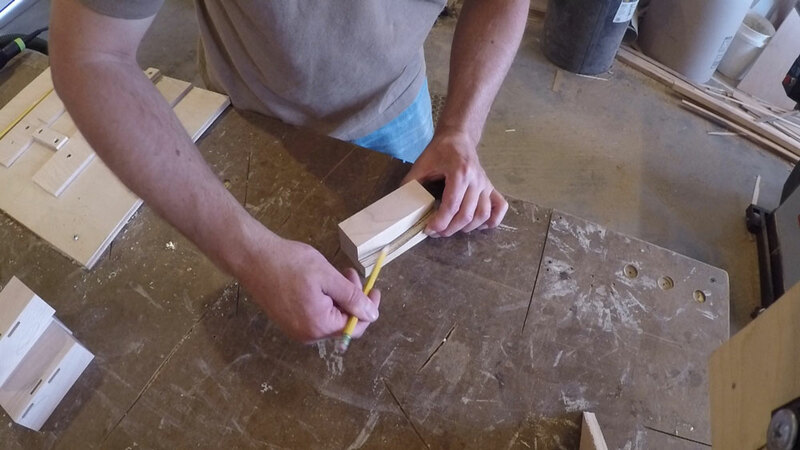 I then used the jointer to square up two of the edges where they will be joined to the sides of the boxes. 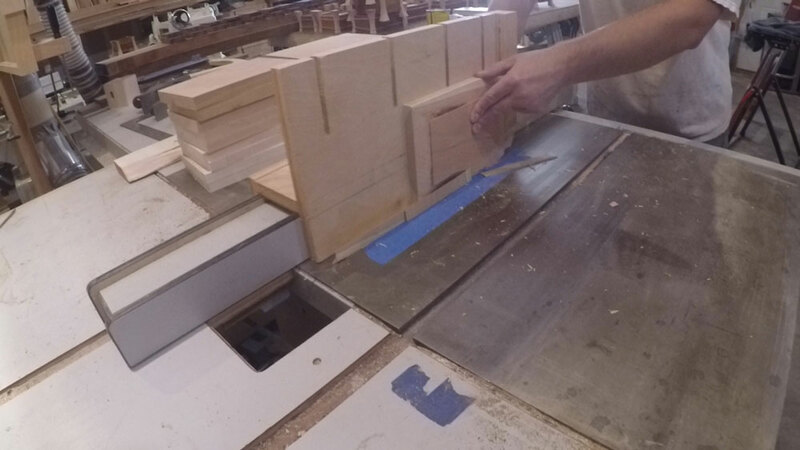 I squared up one end of the legs and then flipped them over and used a stop on the miter gauge to cut them all to the same length. 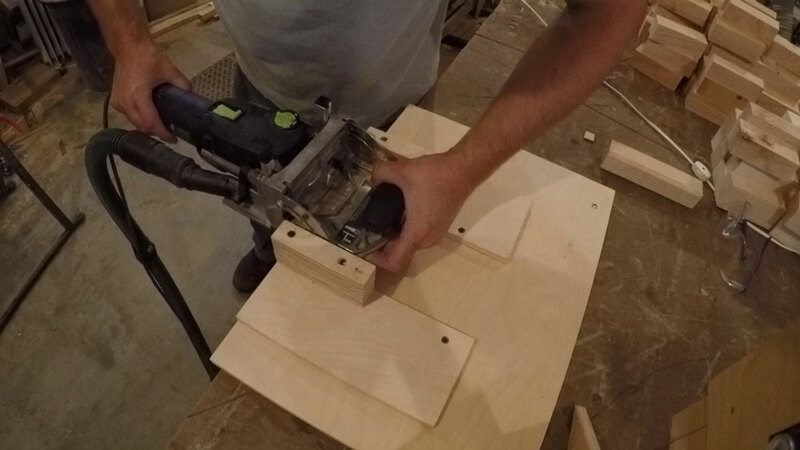 I built a plywood jig to hold the small piece safely so I could use the domino to cut the mortises in the legs. 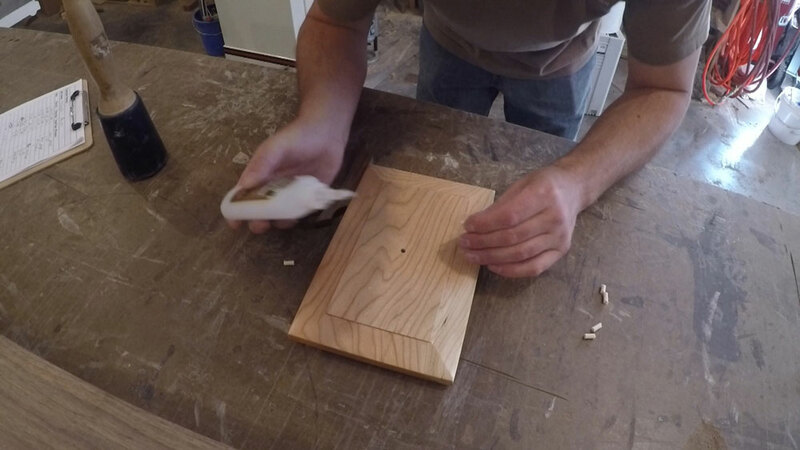 I put a plywood stop on the left and one on the right so I could quickly put a mortise on the top of the leg and towards the bottom, then flip it over to center one for the short side of the box. 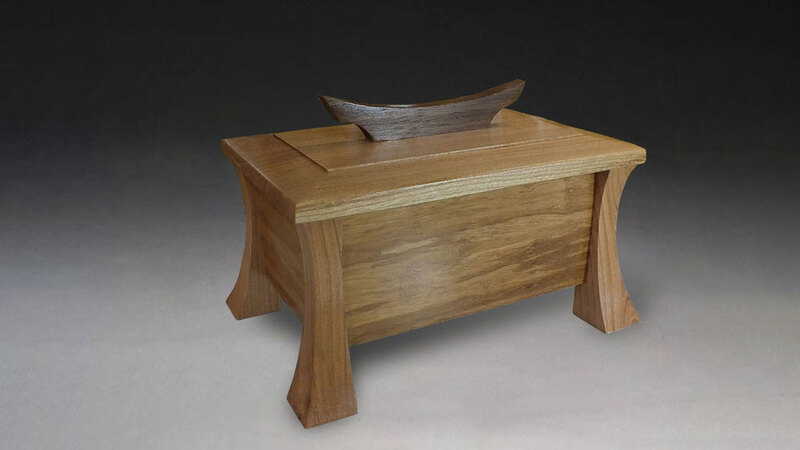 Just because of the amount of room on the leg, and overlap of the mortises, I could only on centered on the center of the short side. I used some scrap plywood to create a template so I could quickly trace out the curved shape of the legs. 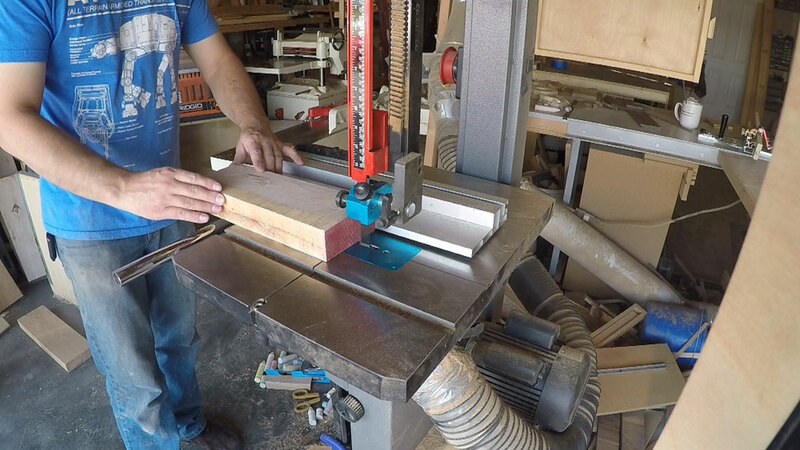 At the band saw I rough out the shape of the legs using a ¼” 6tpi Laguna band saw blade. Just because it felt safer and more accurate, I used a little blue tape to hold the pieces together when I flipped them over to cut the curve on other side. I used my spindle sander to remove the saw marks left behind from the band saw and to refine the shape. For the sides of the box, I used stranded bamboo flooring that was left over from a flooring job. A friend saved if it from the dumpster for me. This product is extremely hard because when they manufacture it they cut the bamboo into random length strands and hold it all together with resin. The resin is so tough that I had to get my sawblade sharpened after this project. 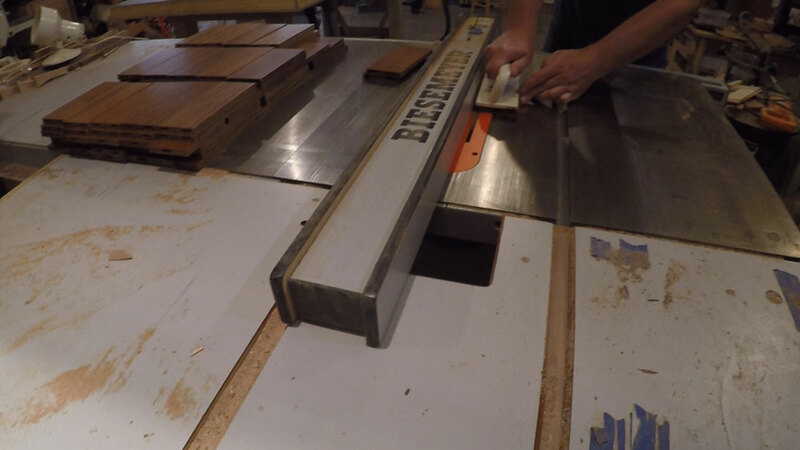 I cut the tongue and grove off the flooring and cut the pieces to length. I paid special attention to be sure I built each box from one board. This way there would not be any huge color variation in the sides on any single box. While most of the boards are fairly uniform in color there is a noticeable color difference from board to board. 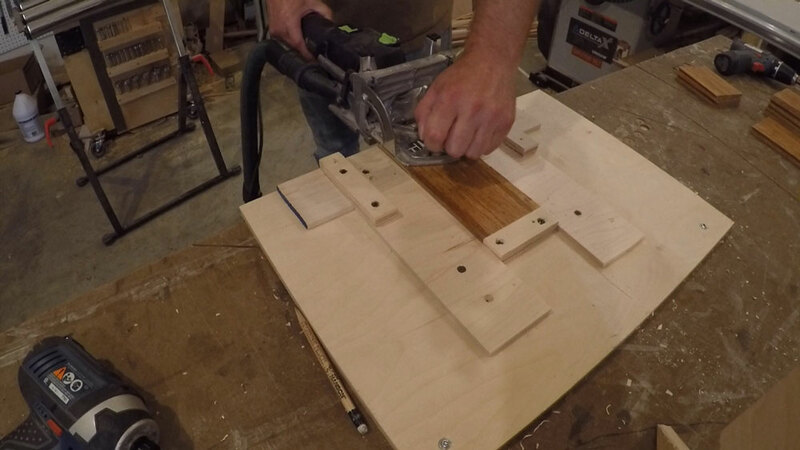 I reconfigured my plywood jig to hold the sides in place while cutting the mortises. This was especially important do to the density of the resin in the bamboo. 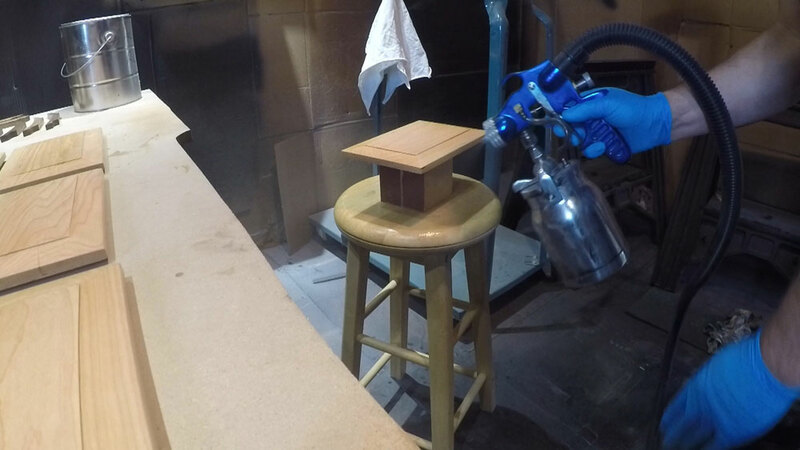 Without the stability of jig, the bit form the domino chattered a lot in the hard resin causing the mortises to be missed shaped. The jig really help stabilize everything and reduced the chatter to a reasonable amount. I also used the same stop position as before to quickly locate the domino placement, one on top and one on the bottom. 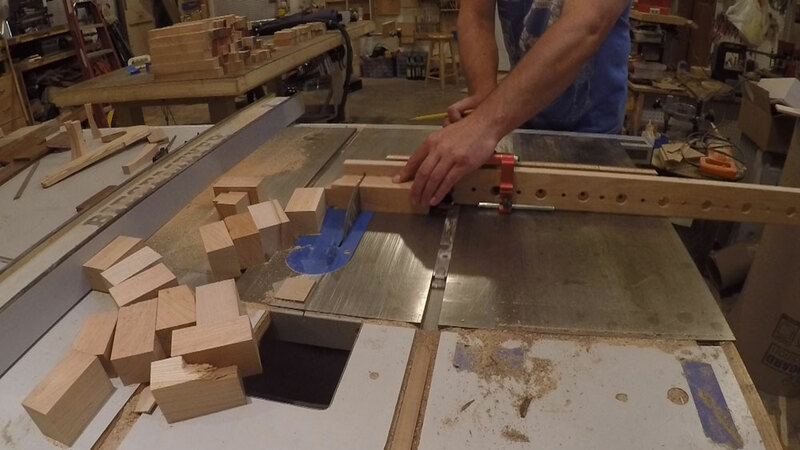 I should probably get my dado blades sharpened as well, 30 boxes equaled 120 dados, to get around all four sides of the box. 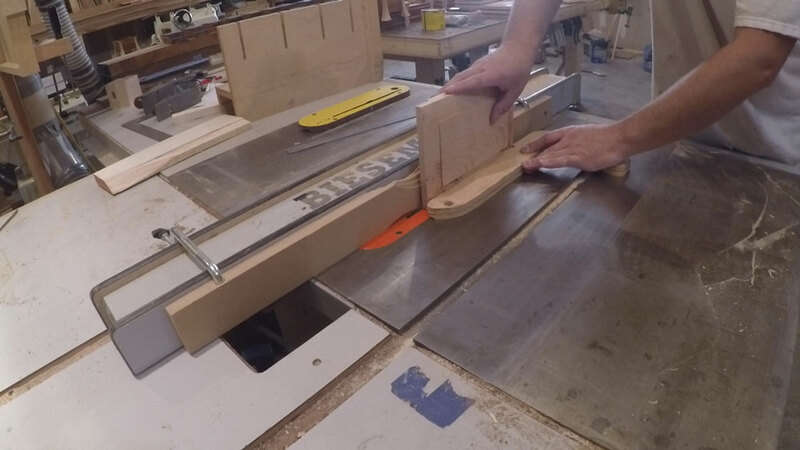 The bottom for the box hit the corner of the leg, so I used my miter key box making jig to cut a small dado in the leg. I also clipped a small about of the corners off the bottom. 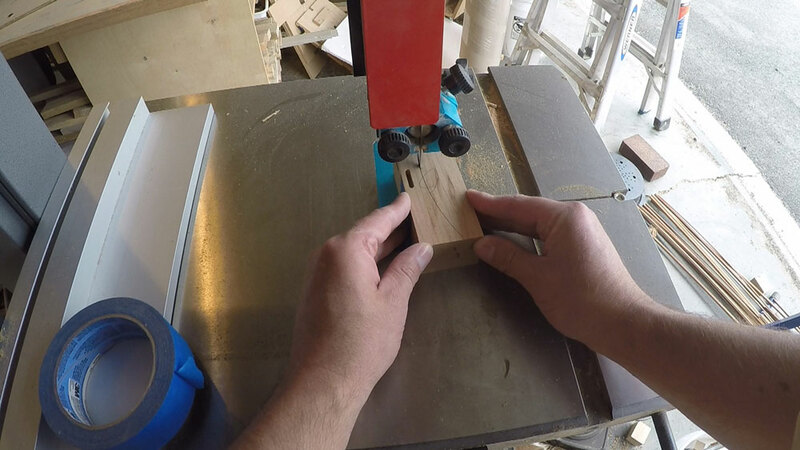 The dado also landed on the lower domino location so I cut a domino in half to make room for the bottom and domino to pass each other inside the leg. 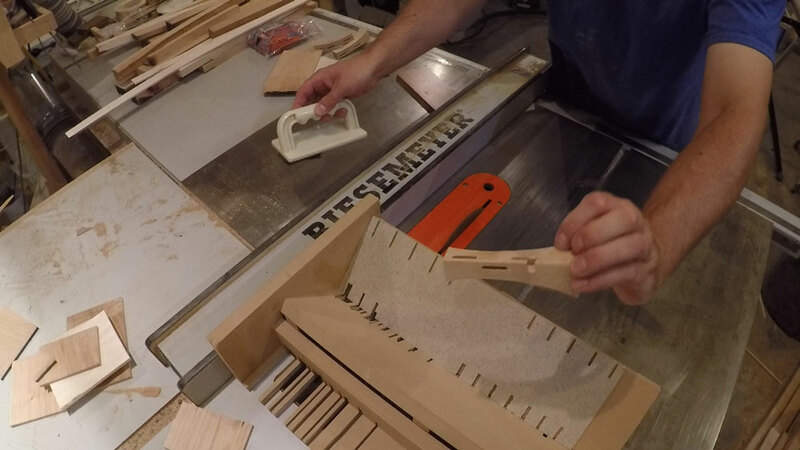 I used epoxy for the glue up and large rubber bands as clamps. 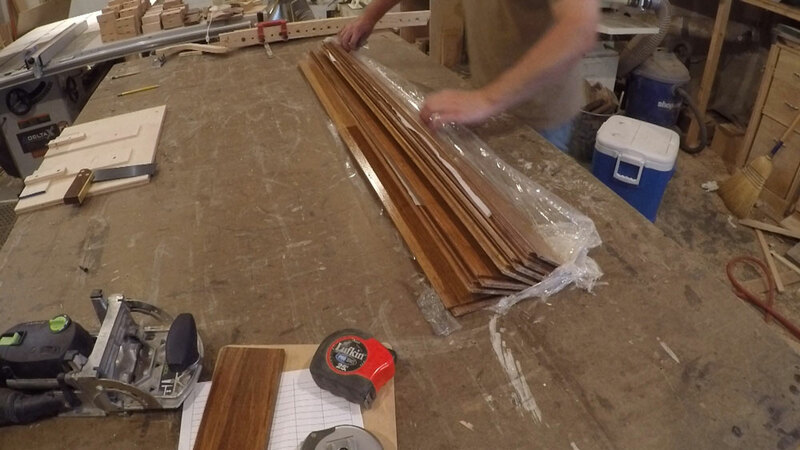 The reason for using epoxy instead of regular wood glue is because I didn’t think wood glue would bond well to the resin in the bamboo flooring. I used walnut for the handle and roughed out the shape on the band saw. 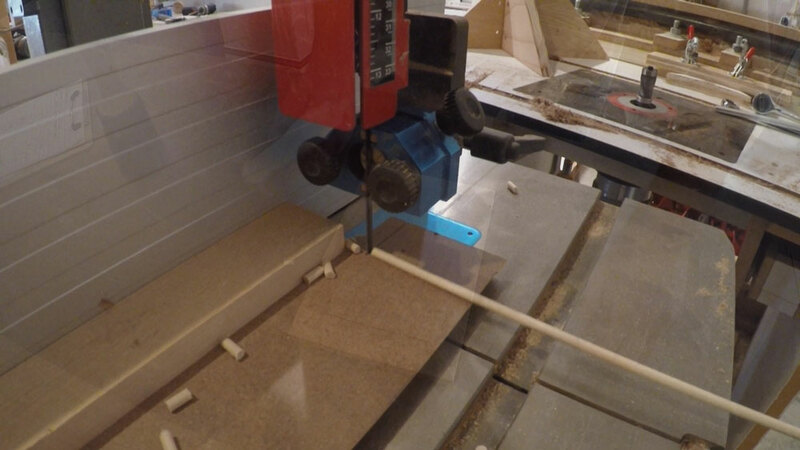 I clamped it to a plywood template and with a whiteside spiral pattern bit I cleaned up the curve on the router table. I then chose a spindle from the spindle sander that I thought had a nice radius on it to put the final shape on the lower edge of the handle. I used some scrap plywood to create a couple of stops so each side of the handle would turn out the same. 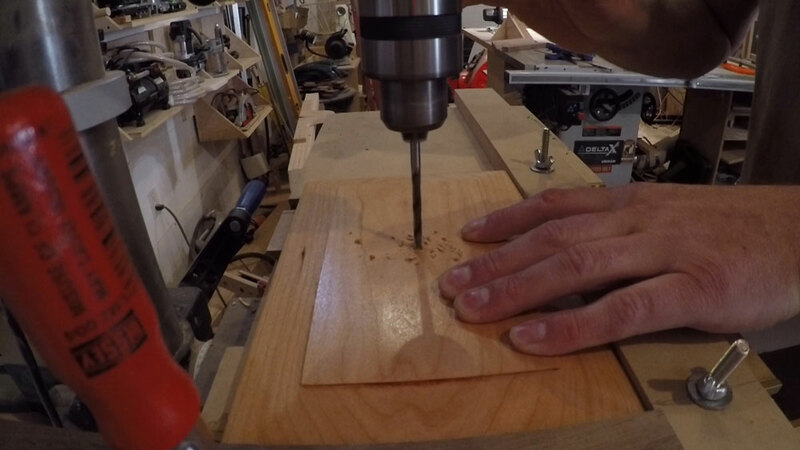 Since I had 30 lids to drill holes for the dowels used to attach the handles, I set up an L stop to quickly locate the proper placement of the lid on the drill press. A little CA Glue, titebond medium to glue the dowel in place and this project is complete.